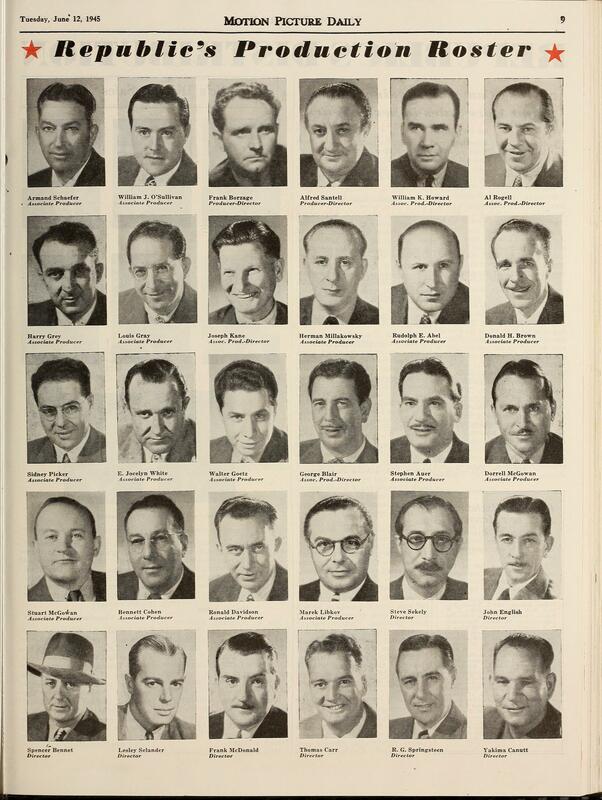 This 1945 Motion Picture Daily lineup of Republic’s directors and producers gives us a look at the faces of several key serial-makers–click to enlarge it. Some of these gentlemen were working on Republic’s feature films at the time, but had done serial work in the past, while others were currently working in the studio’s serial department. The first two pictures in the top row, reading from left, are Armand Schaefer–formerly a regular director/writer on Mascot’s serials–and William J. O’Sullivan–the man who produced most of Republic’s wartime serials and who cemented the post-Golden-Age Republic formula of repetitive plotting and innumerable fistfights. Second from left in the second row is Harry Grey, who supervised the music on several early Republic serials; right after him comes Joseph Kane, who co-directed Republic’s first two serials. The second face in the fourth row is Bennett Cohen, formerly a Mascot serial writer/producer. Next to him is prolific serial screenwriter Ronald Davidson, who had recently taken over as producer of Republic’s chapterplays at the time of this photograph. At the end of the fourth row, on the far right, is master serial director John English, who by this time had graduated to features at Republic. In the bottom row, the first picture is of Spencer Bennet, at the time Republic’s lead serial director. After Bennet comes top-notch B-western director Lesley Selander, who never directed a serial for Republic who did direct Sam Katzman’s only acceptable early Columbia serial, Jungle Raiders. The fourth face in the bottom row belongs to Thomas Carr, who’d played acting roles in the serials SOS Coast Guard and Flash Gordon’s Trip to Mars at Republic and Universal, and who would later co-direct Republic’s serial Jesse James Rides Again and several of Katzman’s better later Columbia serials–Pirates of the High Seas, Superman, Roar of the Iron Horse. The man at the end of the last row, in the bottom right-hand corner of the page, is Yakima Canutt–who was directing Republic’s serials at this time, and who as a stuntman had been a pivotal figure at Mascot–not to mention a pivotal figure in the overall history of serial-making, not to mention the history of the action film in general. This entry was tagged Republic serials, Serial scrapbook, serial-makers. Bookmark the permalink.